-Cosmetic patient protective eyewear goggles, suitable for cosmetic laser procedures, leds treatment, Remove Tattoo and teeth whitening. -Protection wavelength:190nm-2000nm Block all wavelength light . -Absorbting materials, extensively used in laser and cosmestic field. -Static absorbs over 99.9% harmful UV. 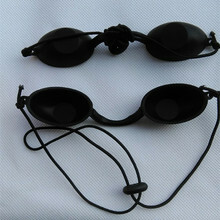 -Since it is for patient, when patient wear it, < 1.2% light can be pass through, it is not suitable for the operator.